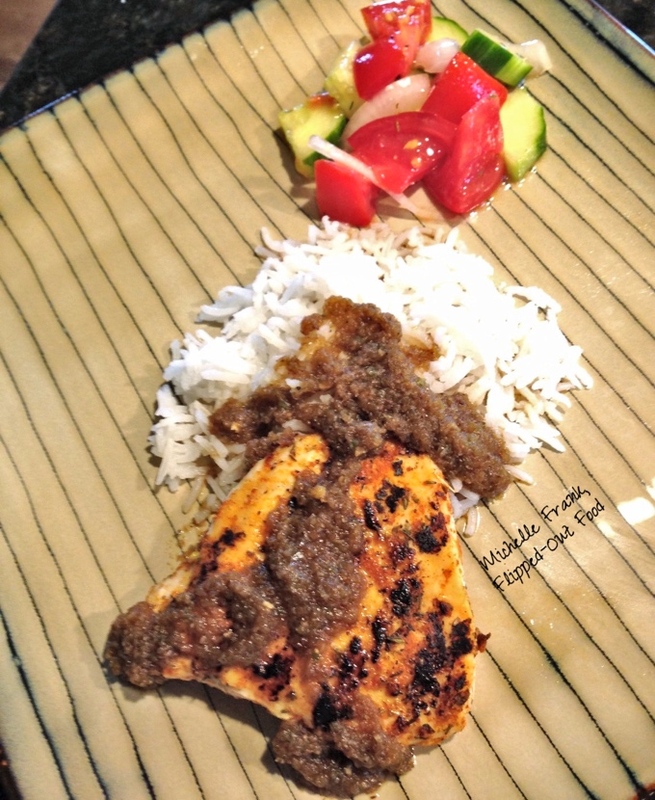 This fiery, flavorful Jamaican Jerk Sauce freezes well for an easy meal anytime. 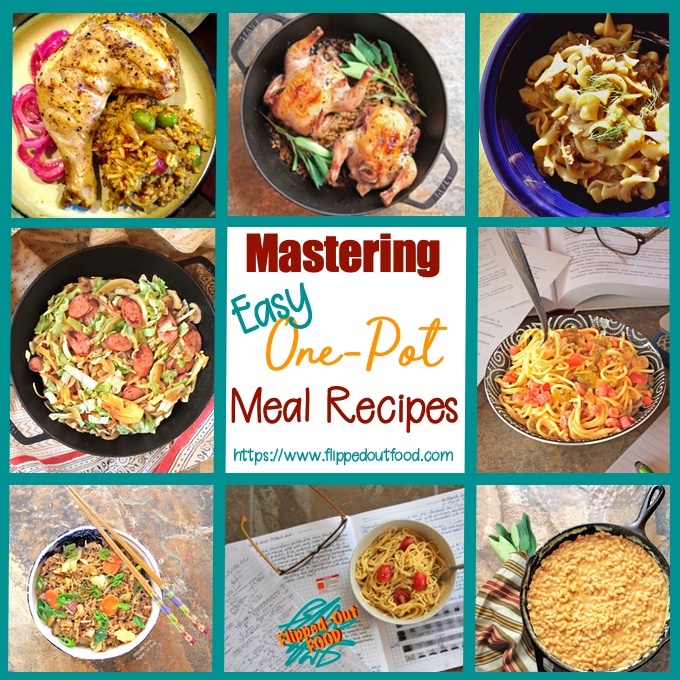 Works great with chicken, fish, shrimp, pork, beef, or simply over rice. I think I’ve mentioned elsewhere on this site—a few places, actually—that the hubs and I are chili heads. This particular sauce is the hubster’s favorite: he insists that I could bottle it, sell it, and we could retire in Jamaica. ​Weeellllll, it’s pretty good, I admit…but I don’t know if it’s THAT good. The Jerk Sauce recipe I’ve used is in my handwriting (printing, actually: see below) in a small notebook that I’ve had for more than 15 years…I know that I got the recipe from SOMEWHERE (thanks, Captain Obvious), but I have no idea now of where that might be. I’ve futzed with it over the years until it has become Phil’s favorite: he wants to eat this “magic sauce” every week. 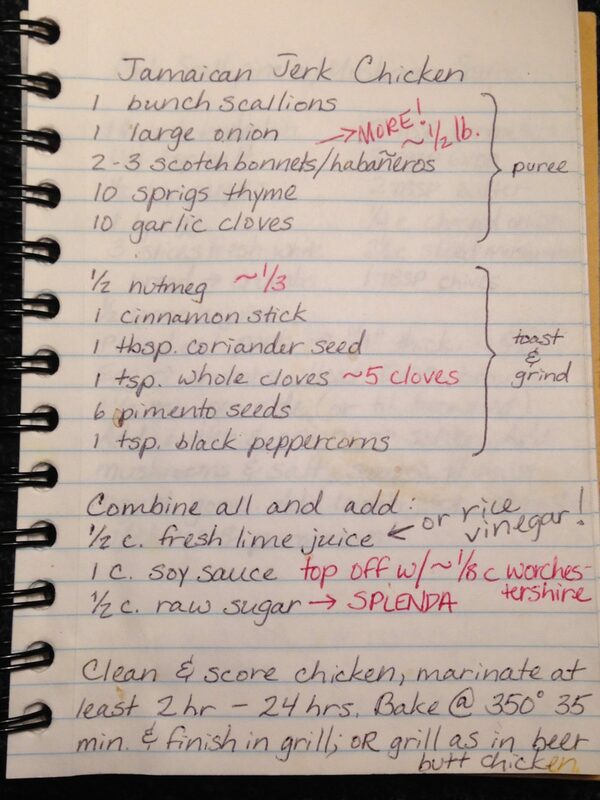 My old, old recipe for Jamaican Jerk Chicken. 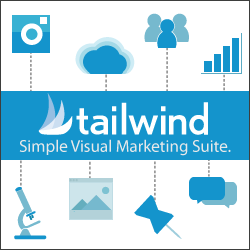 It’s gone through many adjustments over the years. ​Anyway. I call it Angry Jerk Sauce (get it? get it?) because of the sheer amount of angry, hot pepper I put in. We like our sauce toward the nuclear end of the heat spectrum, but I completely understand if you don’t feel the same way. Start with half a pepper if you’re worried: you can always add more later. In fact, the sauce is very tasty even if you leave the peppers out altogether. I usually take a weekend afternoon to make 2 batches of this sauce, which I dole out into quart-sized freezer bags. I double-bag them in a gallon-sized freezer bag: this method keeps the sauce good for quite a while. In fact, I’ve always used every last drop of it before I see any evidence of freezer burn. 1 batch is all my food processor can handle at one time, though I toast and grind all the spices at once, mixing them in later. There’s an entire bunch of scallions, a whole onion, thyme, lime juice, soy sauce, rice vinegar, lots of spices, sugar, and…oh, yes: several habañero peppers. I always have Phil check the heat level of the first batch: if it’s too hot, I don’t add any habañeros to the second batch. Left, the cast of players for my Jerk Sauce. Right, top: Jerk Fish with green beans and coconut-habañero rice. Right, bottom, Jerk Shrimp with coconut-habañero rice. NOTE: Jamaican jerk sauces usually call for Scotch Bonnet peppers, but I like habañeros myself—I grow habañeros in my garden for exactly this reason. Any peppers that I don’t use immediately (and there are usually a lot!) get “Food Saver-ed” for emergency batches of jerk sauce during the winter. In true Flipped-Out Food form (the Saucy Two-Step), constructing the jerk sauce is a bit of a production. But once you HAVE ample amounts of the sauce in the freezer, it’s a simple matter of pulling out a serving to use in a wide variety of applications: jerk sauce chicken, jerk sauce pork, jerk sauce fish, jerk sauce shrimp, or use a jerk sauce marinade. 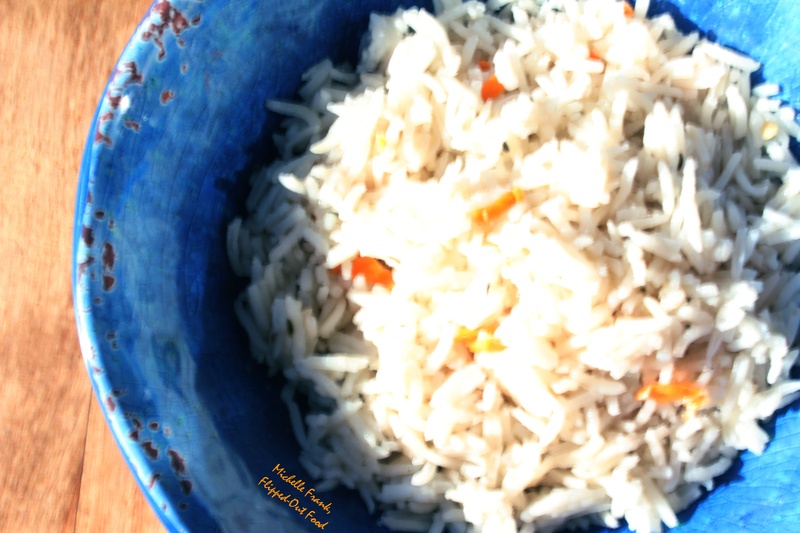 You could also eat the jerk sauce with roasted veggies…or simply over rice. For jerk chicken, I use thighs or breasts (boneless, skinless varieties cook faster, but I frequently use bone-in nonetheless). I score the chicken (make diagonal cuts​ in a criss-cross pattern over the chicken) and put it in a plastic zip-top bag with half of one portion of the sauce for at least 4 hours (up to overnight). The other half of the marinade gets refrigerated to serve with the chicken and rice. To make the chicken pictured at the top of the page, I simply brushed off most of the marinade from the meat (bone in, skin off) and then added the chicken to a hot, well-oiled grill pan or cast-iron skillet. I left the meat alone on medium-high heat for 1 minute, and then rotated the chicken by 1/2 turn for an additional minute before flipping and repeating on the other side for a total of 4 minutes. Then I finished the chicken off in a 350º oven for 20-25 minutes until the inner temperature reached 165º. You could, of course, cook the chicken on the grill: be very vigilant, because the sauce contains sugar and tends to burn. After getting some good grill marks, I’d suggest cooking the chicken with indirect heat, rotating once during the cook time. The chicken goes great with rice and a side of veggies (with more jerk sauce on the side, of course). 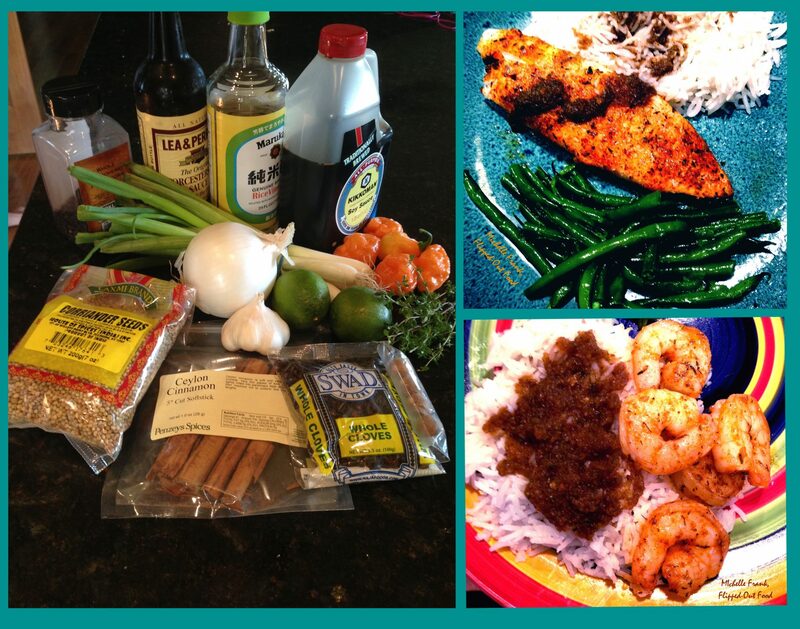 ​I like to cook shrimp and fish in a cajun spice mix and then finish them with the jerk sauce. Shrimp are crazy-fast: just sauté in some butter or olive oil over medium-high heat until they start to curl up slightly. Flip when there’s a good sear on one side; continue sautéeing for 30 seconds, and then turn off the heat. The shrimp will continue to curl up and cook in the pan’s residual heat. We bake tilapia filets in the toaster oven at 400º for 6 minutes on each side. Then, simply add the jerk sauce over the top. 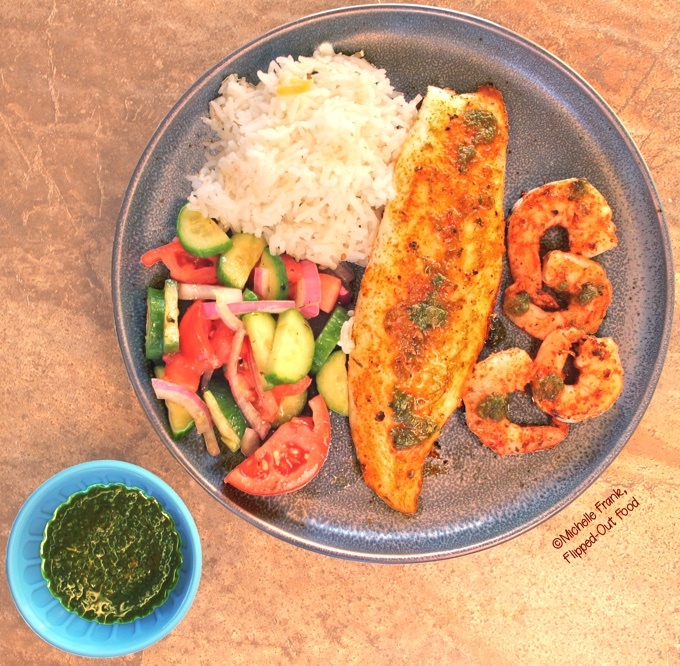 Our favorite way to enjoy Angry Jerk Sauce: Cajun spice-rubbed tilapia and shrimp, sprinkled with the sauce and served alongside coconut-habanero rice and cucumber-onion-tomato salad. 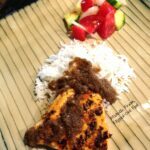 ​However you decide to enjoy this jerk sauce, you can use it to make a super-fast meal for those busy weeknights. 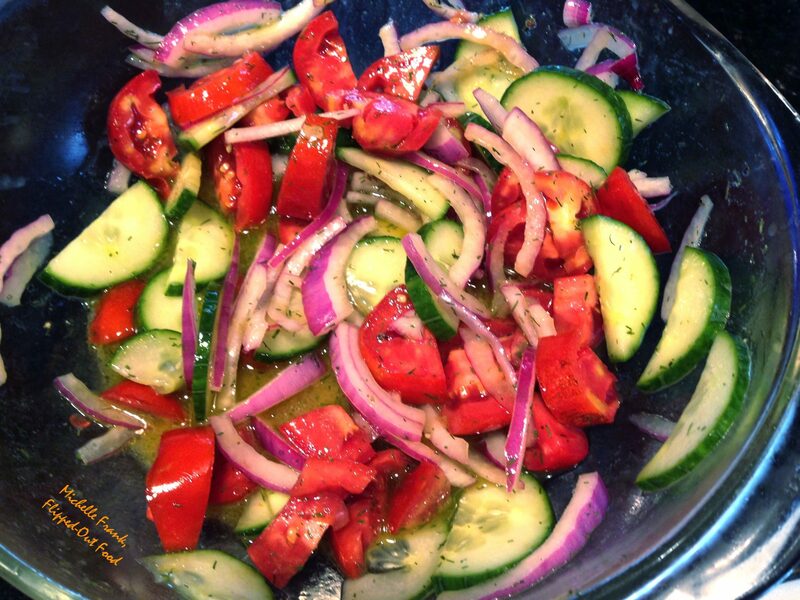 One of my favorite, crazy-quick vegetable pairings for Jerk [Protein of Your Choice] is a cooling salad of tomatoes, cucumbers, and onions tossed in a light vinaigrette. This fiery, "Angry Jerk" Sauce is fantastic for chicken, fish, pork, beef, or even over rice. It's a production to make, so I save it for a weekend cooking project so that I have a crazy-easy meal option during the busy workweek! Blend the ingredients for the puree the mixture in a food processor or blender until smooth. Toast the ingredients for grinding in a dry skillet until fragrant. Grind in a food processor or mortar and pestle. Add the ground spices to the puree in the blender or food processor; pulse a few times to mix. Portion out as desired into quart-sized freezer bags based on how much sauce you plan to use per meal (I usually do about 1 1/2 cups each). Double bag the lot in a labeled, gallon-sized freezer bag. Enjoy! I love the name of this recipe and this looks delicious! What a fun way to spice up chicken! This looks like an amazing sauce that would work on just about everything I eat! Thanks, Brandi! I hope you love it! This sounds great. I’ll have to reduce the heat so my toddler can eat it. Have you ever put the meat and sauce in the ziplock bag and frozen it? Then it marinates as it thaws…in theory anyway. Thanks, Amanda! Yes indeed: the freezer-marinating strategy is genius! Angry Jerk Sauce – now this one’s a keeper! Love the flavours, and all the heat going on here! Thank you, Tina! For chili heads, it’s a sure-FIRE winner! That fish or chicken will certainly not be bland anymore!